It's oft-mentioned, in many circles, that efficiency = productivity. This puts all of it on you - the employee/contractor/freelancer to drive your process forward. What does this actually mean, in terms of the relationship between your workspace and how productive you are? How does your workspace impact your productivity? At The Transition we take a different view - you have to be engaged in what you're actually trying to produce, which can bring its own challenges. We would all like to think that the work we do is productive but we find ourselves more engaged in certain aspects of work than others. It's the nature of work - the issue is that the space you work in has a considerable degree of influence in how you work. Workspace is often overlooked in this equation - we hear all the time about streamlined systems, endless meetings on the parameters of a given sequence of tasks and how you can eke more data from so and so. Ask yourself this - are we actually looking beyond the minuscule relationship between things that may or may not work together? Is it that important? Do you as a worker need something beyond the obvious to reignite your drive? Productivity is intrinsically linked to wellbeing - workspace and environment play an absolutely pivotal role in how well you function, for anyone who is employed in any profession. Why suffer the consequences of an inflexible space that works against your natural rhythms? Bring on the VIT - D! Natural light is underrated - it's no coincidence that people who work in spaces with little or no natural light sleep worse. So you sleep worse and by Wednesday afternoon you're already lagging. The Transition prides itself on letting as much natural light into our co-working space for this very reason - you simply can't be productive without it. A major affliction for many of us is the lack of vitamin D that we accrue in a given work day. Deny yourself natural light and you pay for it in lethargy and serious sense of not being all there. The layout of the space is also rather key to a space working with you, rather than being lumbered with whatever desk you happen to develop an unwelcome umbilical relationship with. At The Transition we take a worldly view on this - pick the desk that you want and it's yours. Want to move your desk to orientate it towards a certain window? Feel free, we won't stop you (though we draw a line on you taking your desk outside, there are some mighty fine benches that you are welcome to ponder on). We are all about open plan and flexible working - you define your space the way that you feel comfortable and you get things done! You'll be in good company at The Transition - many of our co-workers are in the business of wellbeing, from yogi's to meditation and mindfulness, we have a gamut of people who will only too pleased to get you into the appropriate head space. Having a "break out" area allows you to take your thought process on whatever you are mulling over and get a new perspective on whichever creative problem is seemingly determined to not play ball. While a water-cooler moment can be handy, we know some comfy sofas and the latest in contemporary art on our walls will rattle your mind into gear at the moments when you need it. Staring at a blank laptop screen doesn't tend to inspire the next leap in your creative venture. It's a known fact that the brain works best on a task in 20 minute bursts. Take the time to disengage from the process - venture away from your desk and get some perspective. Having some quiet time to contemplate shouldn't be a case of you trying to find a corner where you can't hit the clacking of mechanical keyboards or the muttering of someone trying to clear their inbox. We still find ourselves struggling to find areas of a building where we can be alone with our thoughts - this is particularly true when it comes to the decision making process on something big that requires concentration. Is it any wonder that often it's process of decision making that blocks productivity, even if no one else is involved in that decision except you? We have bespoke quiet booths The Transition because we understand you need those moments to just think, without interruption. Feeling empowered about your workspace environment is your right and shouldn't feel like an option - diversity in a space is a catalyst for your productivity. If nothing else, try walking into The Transition for the first time and just let yourself exist. Picture yourself in this purpose built contemporary setting - then imagine yourself hemmed into a corner in an identikit office space that looks or feels no different from the other faceless areas of a conveyor belt office culture. Take control of your space, be productive every day and push forward with us at The Transition. The life of freelancer is often romanticised as that of an intrepid adventurer, gliding through their work life without a care in the world. This idea has, in modern times been further embellished by the notion of being a “digital nomad”, hopping from place to place with no roots to put down. Why though do we have this new moniker attached to us? Just because we work for different clients, it doesn’t mean that we don’t need a base of some description to peddle our wares? The advent of freelance co-working spaces like The Transition is no coincidence. Many of our resident freelancers have commented that they never thought about using a bespoke space, let alone the notion of interacting with others. Because we’re supposed to be nomads, right? The expectation that the word “freelancer” puts on us implies singular and solitary. 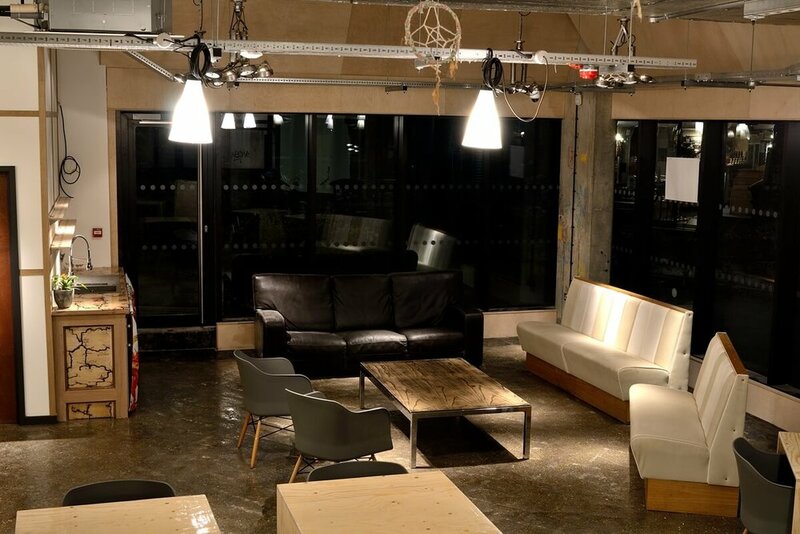 The co-working model at The Transition is a simple idea – rather than suffer an existence of just you and your screen, we offer you a space and atmosphere that is geared towards getting your head into the right space. We’ve all been in the situation where we have had to decamp from our homes in search of a more focussed environment – that or we just can’t stare at the washing up any longer. I digress. Take a walk around the various coffee shops in Chelmsford and you will see a familiar pattern emerging. There will be a great many freelancers nursing a tepid cup of coffee, having to endure the latest gossip swilling around them, the odd screaming child thrown in and a desk the size of a postage stamp. If you are lucky enough to find power point, you guard it with your life. The most importantly element that is missing however, is like minded individuals with the same goals and drive as you. This is where The Transition shines. I like my nomadic existence! Go to any school and you will find children of all ages working corporately in groups of all sizes. Most of us are from a generation where collaboration and interaction are encouraged, to prepare us to work with a number of different people with a multitude of different views. Why then do freelancers end up in the equivalent of solitary confinement, in spaces that are not geared towards inspiration and productivity? Freelancers, in general, are creative’s. Even if you aren’t into graphic design or content you can still benefit from a co-working space. Essentially, you need a neutral space. A space that will allow you to think, rather than longingly staring at the fridge as you fight procrastination off with a big stick. Some would argue that coming to The Transition is merely a substitute for going to an office, as if you were wedded once again to a corporate space that you wanted to avoid, hence, why you became a freelancer. We believe in co-working because we know it works . It works for the simple fact that being situated with your peers, as they feverishly engage with the task at hand, will subconsciously push you to get what you need to get done – done. Distraction is the freelancers bane and let’s be honest it doesn’t take much for our minds to wander. Our space is quiet without being silent, a gentle hubbub of keystrokes and whizzing brains. There is another element to the co-working model. You may be in a situation where your client is after a little bit extra. This happened to me once – I had a client in New York who wanted a redesign of his promotional materials. I could do the content, except for the graphic design element. How I wish I could have had a graphic designer sitting ten foot from me so I could throw them some work and possibly a new long term client. We all have our specialism – wouldn’t it be better for us if we could cross pollinate, offer help where it was asked for and all benefit in the process? What other space in Chelmsford can you feel like you belong to? Where else can you take advantage of the co-working approach? The Transition is waiting for you.